Before Love Me Tender was released at the movie theaters, Elvis Presley had already become a worldwide sensation. Being his first film, although quite campy by today's standards and released in Black & White, he's featured as ‘introducing'. But even though he played a smaller role Elvis put the moviegoers into theater seats. Now on Blu-ray for the first time the film would make a very good addition to a film library or even for the fun of seeing the teen idol at the early age of 21. The story centers on Confederate soldiers Vance Reno (Richard Egan) and his brothers Brett (William Campbell), and Ray (James Drury) who return from the Civil War with a lot of cash they acquired in a raid on the Union. Unaware that the war had ended at the time, the boys thought it belonged to them as confiscated money. The boys have been gone for years and Vance had been reported dead to his beloved Cathy (Debra Paget) who he thinks waits for his return so they can get married. When he shows up at the homestead and finds that his youngest brother Clint (Elvis Presley) has already become her husband, Vance leaves the homestead in search of a new life. The script goes on from there where we find Vance in trouble with Wells Fargo over the stolen money. Director Robert D. Webb (The Proud Ones) keeps the film exciting with lulls that feature Elvis Singing the title song and three others including "We're Gonna Move" and "Poor Boy". Webb works the black and white well even though the scenery of the old South is a big part of the film. He keeps the cameras close to his actors making them and some nicely designed costumes the center of attraction instead of huge vistas and rolling hills. Elvis seems unsure of his acting and it shows in the movie, but in those days it was all about the rise of the rock'n roll icon. You can see Webb struggling with Elvis to get a realistic performance among the more noted Richard Egan and Debra Paget. In some instances the scenes look choppy and may be due to retakes, especially during the romance and rebuke involving Clint, Cathy and Vance. Love Me Tender fared well at the box office garnering nearly $10 million dollars worldwide. That would be a huge sum at today's movie ticket pricing. His ardent followers made up mostly women and aspiring singers made him the king of rock'n roll. In all Elvis appeared in 31 films most all were box office successes. "Audio Commentary by Noted Elvis Historian Jerry Schilling"
"Featurettes" Elvis Hits Hollywood, The Colonel & The King, Love Me Tender: The Birth & boom of The Elvis Hit, Love Me Tender: The Soundtrack. The quality of the video is extremely good considering the transfer from the old film stock to video. The film is offered clear and clean with good images that make for a very nice presentation of the film on home screens. The sound quality comes across very good with no distortion detected though my sound system with either the DTS-HD Master Audio 1.0 or 5.1. The dialogue is crystal clear and easy to understand giving the film a very good presentation and even with some surround action to boot. 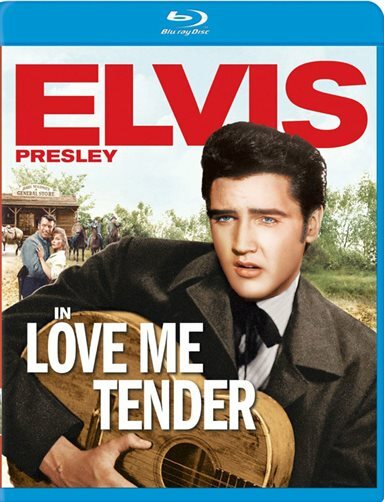 Download Love Me Tender from the iTunes Store in Digial HD. For more information about Love Me Tender visit the FlickDirect Movie Database. John Delia has been on all sides of the movie business over his lifetime from writing for newspapers to film making. He has been a film critic for many years and earned his Bachelor's Degree in Journalism and Communications from the University of Florida. John is also a member of the Southeastern Film Critics Association (SEFCA) which is comprised of more than 40 journalists working in the print, radio and online media. Read more reviews and content by John Delia.